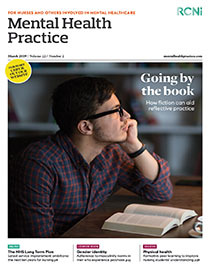 Background Reflective practice is vital to be a competent healthcare practitioner: reflective writing is mandatory for nurses’ professional revalidation. Aim To explore the experiences of nursing staff in a mental rehabilitation service taking part in reflective practice groups (RPGs). Method Nine staff members were interviewed using a semi-structured interview format. Interviews were transcribed using thematic analysis. Findings Six themes were identified: emotional benefits of the group; new perspectives and knowledge; relationships are affected by the groups; factors affecting variability of group usefulness; barriers to group usefulness; and group structure. Conclusion Reflective practice was valued by the nursing team and led to some positive changes in practice. This initial evaluation should be used to inform a larger research project looking at RPGs in more detail.